The most illustrious meteorite inhistory continues toinspire heated debate. Does it carry microbial fossils from Mars or areitsstrange features just the product of some unique geochemistry? Afteralmost 20years, dueling papers are still coming out, and the opposing partiesare nocloser to a resolution. Most scientists agree that the meteoriteALH84001 is the oldest meteorite ever found to have come fromMars. "The meteorite is so old that ifMartian life existedback then, it probably floated by the rock at some point," says TimothySwindle of the University of Arizona. "But did it leave any record?" In 1996, one research group claimedyes, sending shock wavesthrough the scientific community and beyond. President Bill Clintonmade aspecial address on the apparent discovery, and the media widelybroadcasted thescientists' images of what appeared to be dead "bug" remains from therock. Had we finally met our neighbors? The iconic meteorite became the gristfor many imaginations.The TV show The X-files depicted an ALH84001look-a-like with live bugs in it,and a Dan Brown novel imagineda conspiracy to cover-up extraterrestrial evidence from a space rock. The meteorite made its debut in 1984,when it was picked upby a geologist team riding snowmobiles through the Allan Hills regionofAntarctica. It took 10 years for researchers to realize this 4-poundspecimenlikely camefrom Mars. The general consensus now is that theoriginal rock formed 4billion years ago on Mars. It was eventually catapulted into space byan impactand wandered the solar system for millions of years before landing onEarth13,000 years ago. 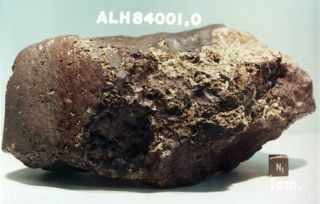 Over 50 other meteorites have beenidentified as coming fromMars, but ALH84001 is by far the oldest, with the next in age beingjust 1.3billion years old. "That alone makes ALH84001 a veryimportant sample,"says Allan Treiman of the Lunar and Planetary Institute. "It's our onlyhope to understand what Mars was like at this time period." The first thing that struckresearchers examining themeteorite was the presence of 300-micron-wide carbonate globules thatmake up 1percent of the rock. Dave McKay from NASA's Johnson Space Center andhiscolleagues determined that the carbonate most likely formed in thepresence ofwater. Although evidence for a wetancient Mars has accumulated in the subsequent years, theclaim thatALH84001 once sat in water was pretty revolutionary at the time, saysKathieThomas-Keprta, also from the Johnson Space Center. Inside the ALH84001 carbonates, McKayspotted odd featuresthat resembled very small worm-like fossils, so he asked Thomas-Keprtato lookat them more closely with electron microscopy. "I kind of thought he was crazy," shesays. "I thought I would join the group and straighten them out." In the end, she helped the teamcharacterize the biomorphicfeatures, as well as unusual grains of the mineral magnetite found inthemeteorite. In a 1996 Science paper, these twophenomena ? along with thechemical distribution in the globules and the detection of largeorganicmolecules ? were taken collectively as signaturesof biological activity occurring long ago on Mars. However, skeptics began to pick apartthe four lines ofevidence presented in the 1996 paper. Groups of geologists and chemistsproposed alternative waysthat the carbonate globules and the organic molecules could have formedwithoutthe need of Martianmicrobes. The supposed fossil shapes were sosmall they could onlyhave been the remains of hypothetical "nanobacteria." A moreplausible explanation, according to other researchers, was that thetinyartifacts are uneven patches in the coating used to prepare the samplesforelectron microscopy. That left the magnetite grains as thestrongest case for abiologic imprint in ALH84001. "The focus of the last 10 years hasbeen themagnetite," says Thomas-Keprta. Magnetite (Fe3O4)is a common mineralfound on black sandy beaches, in iron-rich sediments and even ininterplanetarydust. The majority of this magnetite forms in geologic processes, wheremanyelements mix together and iron often gets replaced with iron-likeelements suchas magnesium and chromium. However, the magnetite grains foundin the carbonateglobules of ALH84001 have very few of these sorts of substitutions. "I had never seen magnetite aschemically pure as thisbefore," Thomas-Keprta says. But when she looked through theliterature, she realizedthat chemically pure magnetite is known from biology. So-called magnetotacticbacteria create a chain of magnetite grains to help orientthemselves intheir search for nutrients. Iron makes for a stronger magnet, so thebacteriaare very selective when they form their magnetite compasses. They alsobuildgrains of a uniform size (roughly a tenth of a micron) that optimizesthemagnetic response. "The size and purity of the magnetiteis controlled bythe organism to be the best magnet it could be," Thomas-Keprta says. In 2001, she and her colleaguesshowed that many of the sameproperties in biologically-derived magnetite are reproduced in thegrains fromALH84001. The conclusion was that Martian microbes once used magnetitefor thesame purpose as terrestrial ones do. Treiman agrees that the ALH84001magnetite is unlikegeologically-produced magnetite found on Earth. "But everything elseaboutthis meteorite is unique," he argues. "There comes a point wherebeing unique is not unique." It's improbable that Martian microbesdeposited magnetitegrains directly in the rock, so Thomas-Keprta and her colleagues haveto arguethat the magnetite formed outside of the rock and washed in. They alsohave toassume that Mars had a much stronger magneticfieldin the past so that building an intracellular magneticcompass would be anadvantage. Treiman and others argue that themagnetite could be explainedmore easily with some sort of shock event that heated the carbonateenough toallow magnetite grains to form. Thomas-Keprta says these abiotic modelsare fatallyflawed. The problem is in the cooling time. If the rock cools too fast,themagnetite ends up full of impurities. Too slow and the surroundingcarbonatebecomes too uniform. "They are looking for a single eventthat can accountfor all the magnetite," Thomas-Keprta says. "But no natural orlaboratory synthesized analogs proposed have yet to reproduce thechemical andphysical properties observed in the ALH84001 carbonate-magnetiteassemblages." She and Treiman went head to head ata recent LunarPlanetary Society Conference. Neither side has relented. "Naysayers are always going to benaysayers,"Thomas-Keprta says. "But I hope people on the fence will look at theevidence." Treiman thinks that the issue isprobably settled for mostof his colleagues. "I am one of the few holdovers still arguing aboutit," he says. "I can't move on." The debate may not be settled anytimesoon. Treiman isn'tsure how one could ever entirely rule out that Martians might have hada handin forming ALH84001. "Nature is infinitely complicated," he says. "It is always surprising us." However, he believes the alternativeexplanations fromgeology and chemistry are simpler, since they don't require inventingthe wholenewscience of Martian biology. Scientists are trainedto pick the simplestexplanation. An informal poll of more than 100scientists by Swindle in1997, right after the first announcement of possible biological relicsinALH84001, showed that most of the community was already hedging theirbets. Thetypical response gave about even odds that Mars once had life but saidthatthere was just a 1-in-5 chance that McKay's group had found the smokinggun. A few years later, Swindle tried todo the poll again butcouldn't get enough respondents to form a representative sample. Hethinks mostpeople had made up their mind that ALH84001 did not carry biosignaturesfromMars. But that doesn't mean that sifting through the meteorite hasn'tbeenworth it. "It was good science," he says. "Itchallengedpeople to really think about what would count as evidence of life onMars."